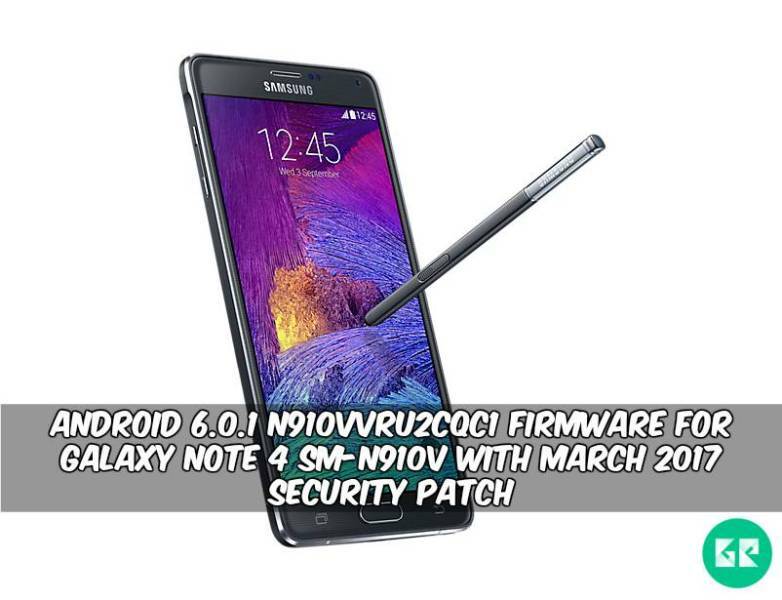 The N910VVRU2CQC1 update is ready for Galaxy Note 4 smartphone. You find more marshmallow and nougat full firmware or OTA update in the previous post on this blog. And officially Samsung launched the latest Android 6.0.1 N910VVRU2CQC1 Firmware For Galaxy Note 4 SM-N910V With March 2017 Security Patch. If you don’t update your device then flash this version of firmware that makes your phone latest marshmallow android version. That is an official stock OTA. Enjoy via this update some exclusive features that were introduced in this android nougat update with new Security Patch. Samsung Released Samsung Galaxy Note 4 SM-N910V smartphone with Android v6.0 (Marshmallow). Galaxy Note 4 runs 2.7GHz quad-core Qualcomm Snapdragon 805 processor and it comes with 3GB of RAM. This device has 32 GB internal storage. Galaxy Note 4 has 5.1 inches Super AMOLED capacitive touchscreen with a resolution of 1440 x 2560 pixels display. Galaxy S7 lets you snap 16-megapixel rare camera & 3.7-megapixel front camera. This update also changed some changelog, the new item added and latest march [01.03.2017] security patch update with other some new features added. We created the direct download link of marshmallow Firmware For Galaxy Note 4 SM-N910V for Verizon USA (VZW). This firmware only for SM-N910V version device. You can install via Samsung Odin tool or Samsung Kies we will guide you how to install via Odin. TURN OFF the Reactivation Lock – Go to Settings > Personal > Lock screen and Security > Find my mobile and log into your Samsung Account then uncheck the turn Reactivation lock on. Fast extract Odin.zip & N910VVRU2CQC1 Firmware.zip via 7zip. After run Odin.exe into the extracted folder. then click the Ap Box, add choose the” .tar ” file. Read Full Odin Flash Guide From ⇒ Here. Note: – First Time It Takes 5-10 Minutes To Boot.